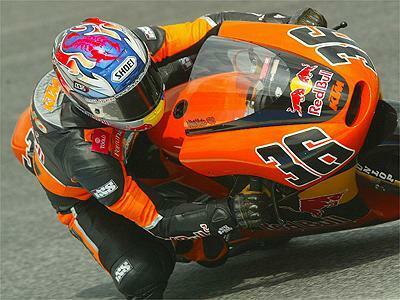 Red Bull KTM will enter three riders in the 125cc GP class and one rider in the 250cc championship in 2005. Current squad member Mika Kallio will stay with the team next season, alongside Hnugarian Gabor Talmacsi and Spaniard Julian Simon. The sole rider in the 250cc class is Autralian Anthony West on the all-new KTM machine. "KTM is delighted to have secured Anthony West," said race team manager Harold Bartol. "The 250cc bike is a development project for 2005, although in the second half of the season we hope Anthony can challenge the top riders. And the 125cc world championship is a primary goal." West, 23, has spent two seasons on 250cc privateer bikes with a wet-weather win at Assen in 2003, in addition to a season in the 500cc class on a Honda V-twin. Finnish rider Kallio, 22, had a best result of second during his first season with the team, and will be joined by 17-year-old Simon, and 23-year-old Gabor Talmacsi.